This is the time of year things really get rolling in agriculture, making it a great time to celebrate National Ag Day. 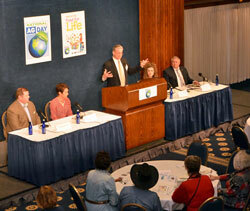 Yesterday the US Farmers & Ranchers Alliance (USFRA) made the most of that day with a panel discussion about SMART farms and how producers today are growing sustainable, nutritious food and how to communicate that to consumers. The panel was moderated by Greg Horstmeier, Editor-in-Cheif at DTN and included two farmers: Chip Bowling, crop farmer from Maryland, NCGA Chair and USFRA Vice Chair, and Lauren Schwab, Ohio pig producer and USFRA Faces of Farming and Ranching. 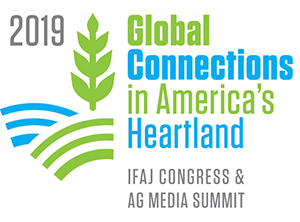 Beverly Flores, Media and Communications Manager at John Deere and Andrew Walmsley, AFBF Director of Congressional Relations presented from the industry and ag group perspective. “Really, since I can remember growing up on the farm we’ve continuously improved the way we house our pigs in order to give them better care and management,” adds Lauren, explaining the depth she goes to to provide proper nutrition and housing for the pigs in her care.